Latly I've porchesd Dell Inspiron 3520 with Windows 8 X64 and for a couple of weeks it's workd fine,but yestarday when I boot it up a constant gray screen was displayd until I restarted it forcely (long click on turn off and turn on afterwards). Since then,every time when I starting my laptop a gray sceen is display for a long few sec' and windows 8 starting afterwards. what should I do in order to fix it? 1. Run the Pre-Boot System Assessment (PSA / ePSA) Diagnostics. It runs the test on the hardware components of the computer. Run the test and check if it gives any error code. Note down the error code and update me with the same, would let you know the next course of action. 2. Update the BIOS to the latest version. **NOTE: Few things to ensure before updating the Bios is, the Ac Adapter should be plugged in and the battery should have minimum of 15% charge. No other external peripherals should be connected to the computer. Please ensure that the Bios update should not be interrupted else it would damage the motherboard. 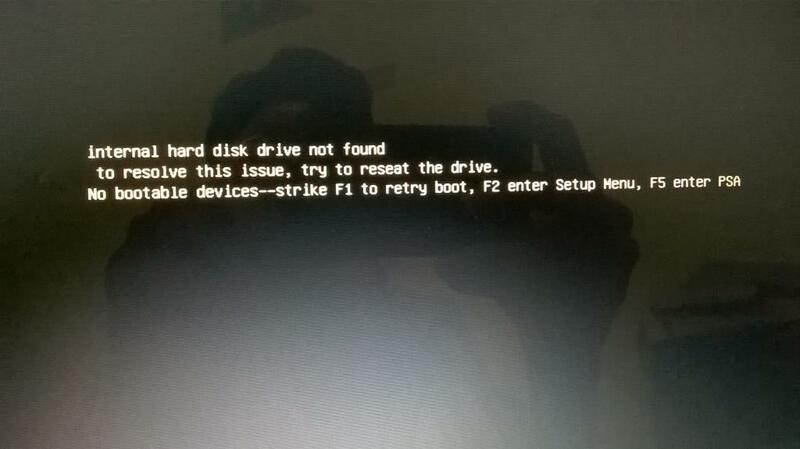 -- Boot list option is set to UEFI. -- Secure Boot is Enabled. -- Load Legacy Option ROM is Disabled. Please try the steps and write back, would be glad to assist you further. 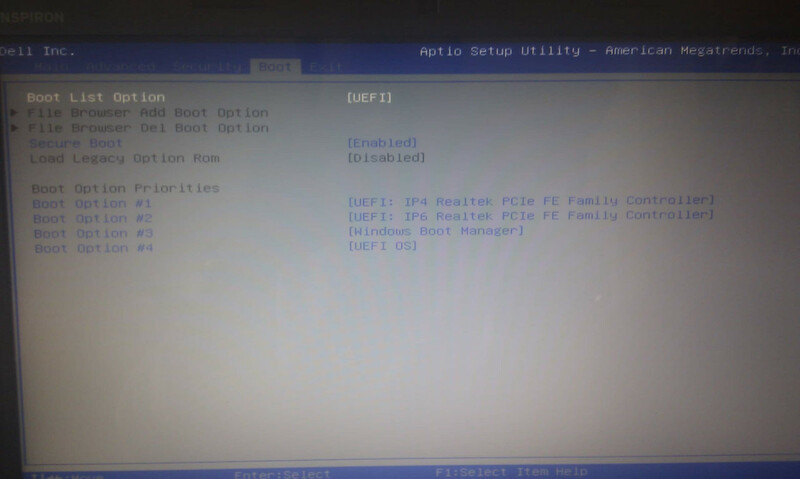 -- Boot list option it is set to UEFI. -- Secure Boot it is Enabled. -- Load Legacy Option ROM its is Disabled. please find the BIOS pic attached. do you think I should install the graphic drivers again? Try booting into safe mode with networking and check the functionality. -- Keep tapping F8 at the Dell Logo Screen. -- Once the computer enters Advanced Boot Option, select Safe Mode with Networking. -- Check if the computer is doing the same thing in safe mode with networking. -- Uninstall the Video drivers from the Program and Features. 4. Uninstall every program related to ATI Catalyst Control Center. -- Delete the folder named Video from the Dell Drivers Folder. 3. Open the C Drive. 4. Open the Folder named Dell. 5. Open the Folder named Drivers. 6. Delete the Folder named Video. -- Uninstall the Video Drivers from the Device manager. Start -> Control Panel -> Device Manager -> Display Adapters. -- Please do check in the startup items as well, if there is anything related to the video card. Disable it. Start -> Run -> MSCONFIG -> Start Up. -- Restart the computer and check if it boots into the normal mode. In case computer reboots into the normal mode, re-install video drivers. Visit the Dell Drivers and Downloads website to get the video drivers. Enter the service tag, choose the operating system and download and install the video drivers for the computer. Please try the steps and write back with results, would be glad to assist you further. as picture shows i'll do all the steps but when i reboot my system it will give an error that ""internal hard disk drive not found""
Hi there I am having the same issues with the black screen reading the same message, I'm running the test you had mentioned for your first idea; it's reading everything but the hard drive. Is there anything I can do from here?